Android may just be the most successful operating system of all time, and a recent study from the International Data Corporation (IDC) shows just how quickly Google’s mobile OS is growing. While every competing OS lost market share over the past 12 months, Android continued to surge and now runs on almost 85 percent of all smartphones on earth. Android shot up from a 79.6 percent share of the smartphone market a year ago to 84.7 percent today, but the rest of the industry didn’t do quite as well. Apple’s iOS dropped from 13 percent of the market to 11.7 percent in the same 12 months, while Windows Phone dropped from 3.4 percent to 2.5 percent and BlackBerry slipped from 2.8 percent of the smartphone market all the way down to 0.5 percent. 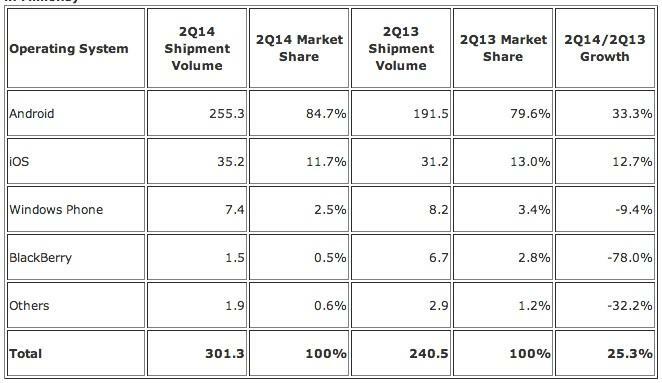 iOS and Android did see gains in shipment volume, however. 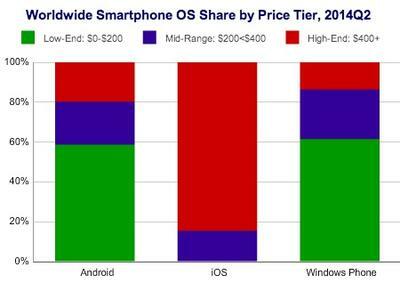 The study also breaks down Android, iOS and Windows Phone by price tier, revealing that Google and Microsoft are fighting over the low-end while Apple continues to largely ignore the sub-$200 category. For Google, the big question now is how much more room for growth Android has left. We doubt the most die-hard Apple fans will ever consider switching over, but both Windows Phone and BlackBerry’s remaining market share seems like an easy target for future Android growth. Google also recently announced plans to expand its mobile OS into cars, TVs and wearable devices, giving Android plenty more room to grow in outside of mobile.